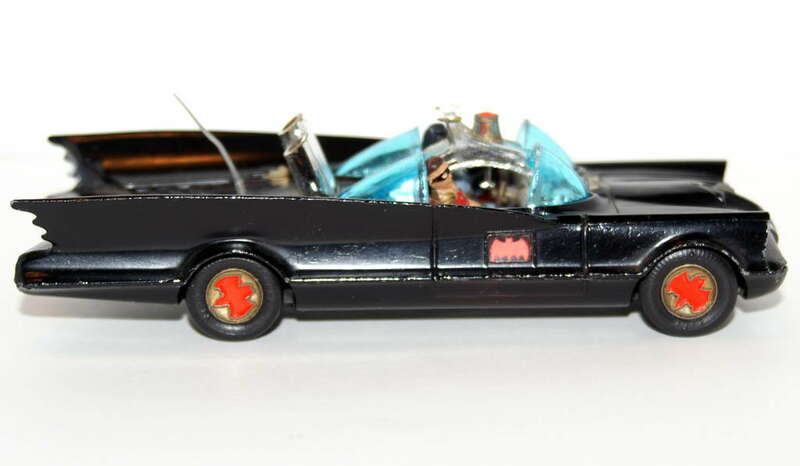 1966, Corgi Batmobile, matt black. 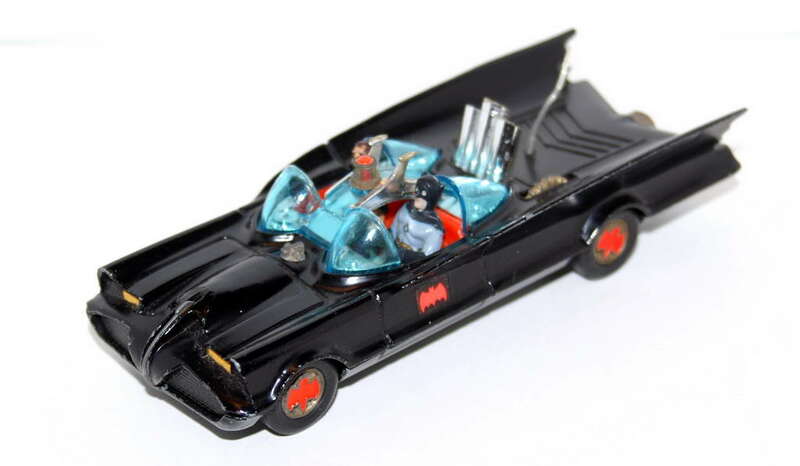 1966 "Long tail fin, taillight recessed, two noses recessed, slightly transparent aerial"
Distinguishing features of the original style Corgi Batmobiles include : hollow or recessed nostrils in the bat nose, rubber tyres and gold wheel hubs with red bats, a "Batmobile" label on the underside of the car, a turbine exhaust nozzle, a pulsating exhaust flame, longer tail fin tips and recessed taillights. In later versions, eventually each one of these features changed. 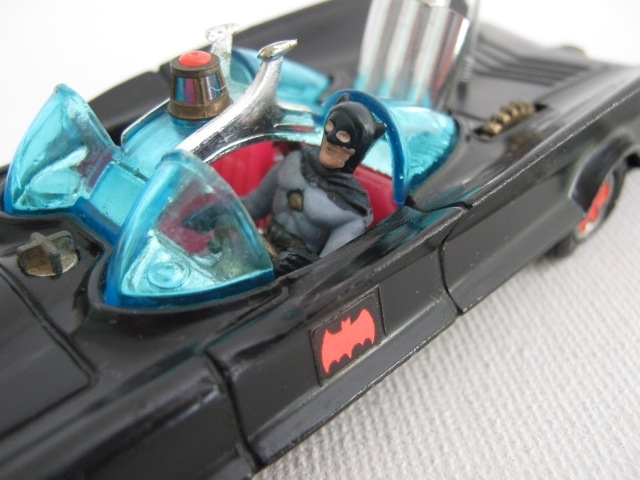 The aerial on the first matt black Batmobile were slightly transparent, you can look the light through. 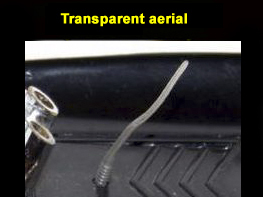 After the aerial changed from silver. Early matt black have a slightly transparent aerial, i don't know if the later matt black have or not the silver aerial. 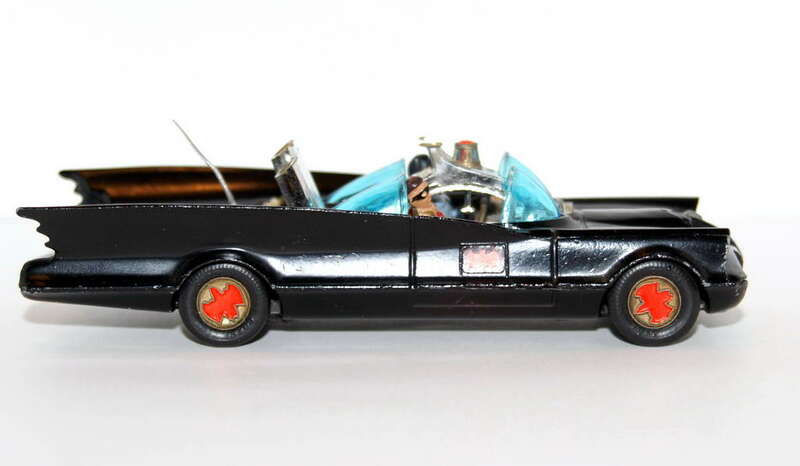 I see many matt black in photos with silver aerial but i can't tell if it's genuine ou repainted car !!! 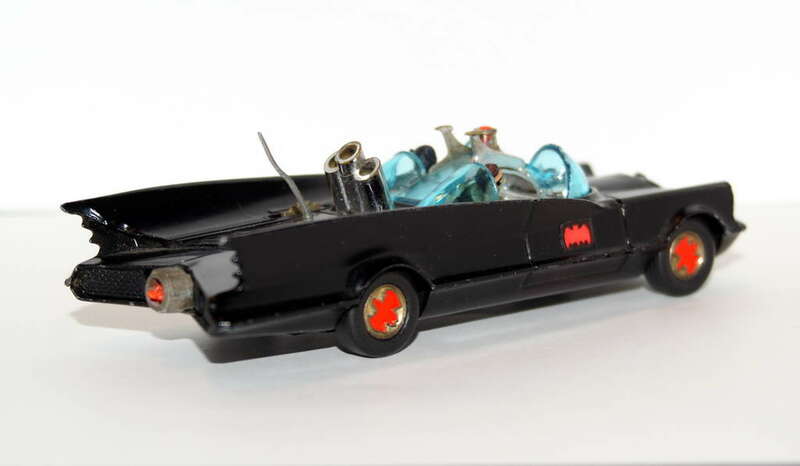 This was the first version of Corgi Batmobile. 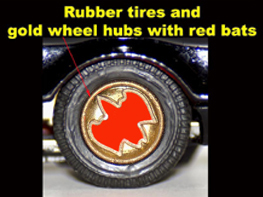 It featured gold wheel hubs with red bats, rubber tyres, pulsating exhaust flame, no tow hook, and was the only version painted matte black. 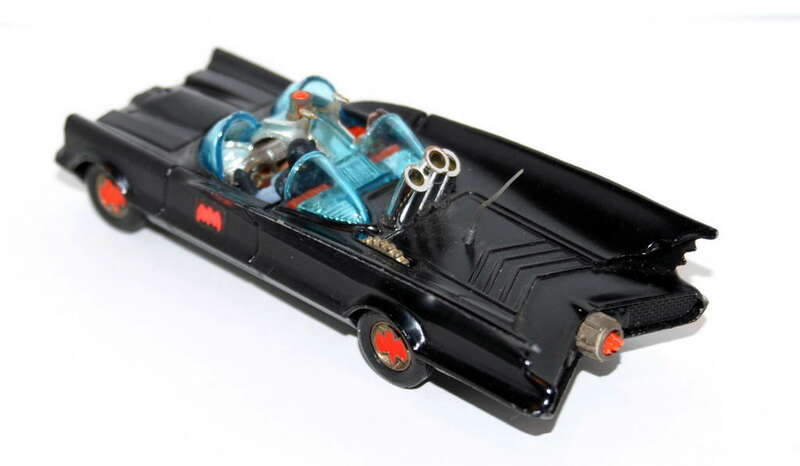 As far as the body style is concerned, it is the most detailed. 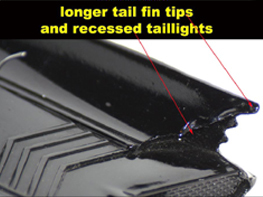 The defining features of the body style are the fully recessed tail lights and longer tips on the tail fins. 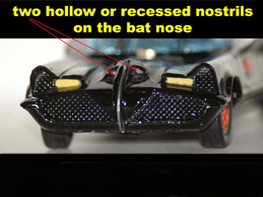 Also, near the front of the hood, both of the "nostrils" on the bat nose were recessed. 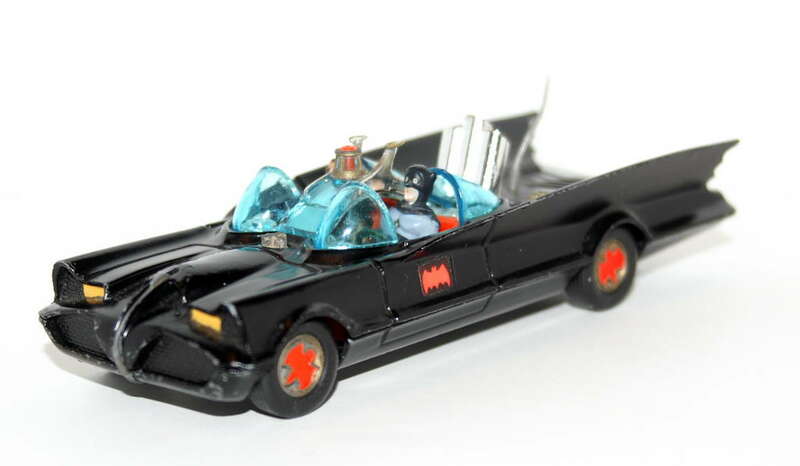 Batman was molded in grey and although not painted with precision, Batman and Robin were painted more carefully than they were later in the 70s and 80s. 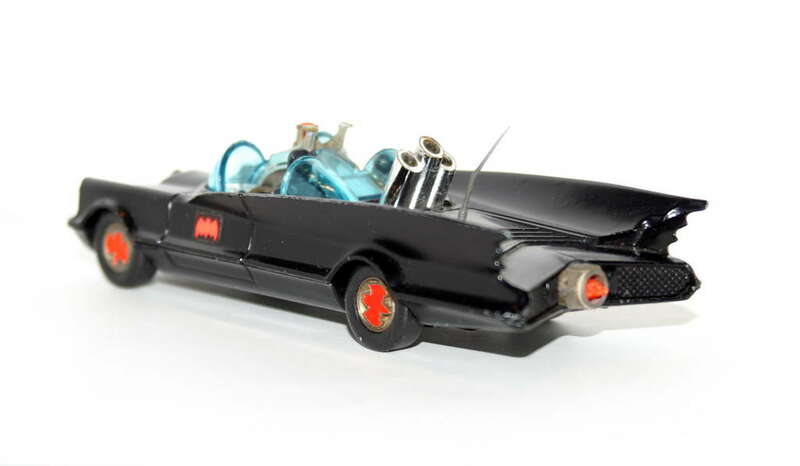 The reason for the matte black, I believe, is that early on in the production of the "Batman" TV series, the original Batmobile was only painted in black primer or matte black. 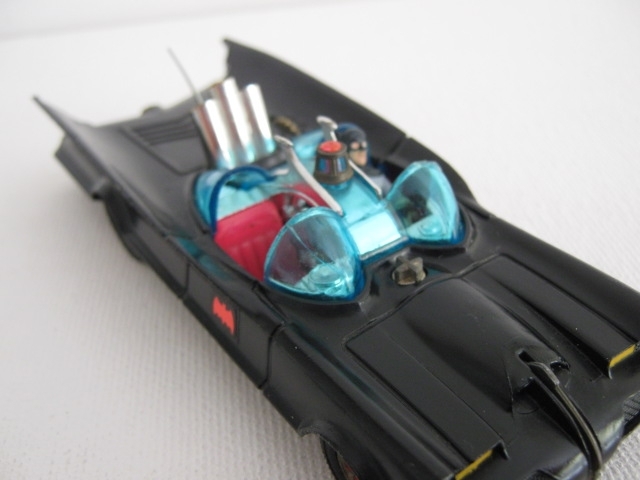 But by the time they actually began filming, the car had been painted gloss black which leads to the next variation. 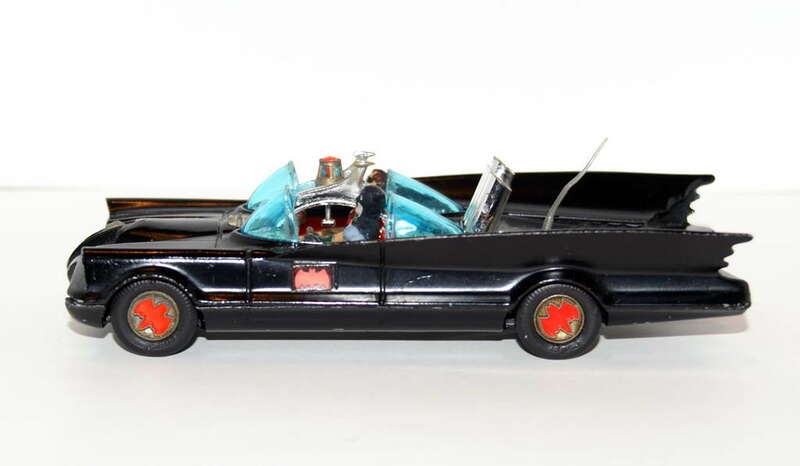 1966 Corgi Batmobile matt black, ran for 2 months only, exactly the same as the 66-67 version, apart from Robin and the paint was matt black This was due to the designers viewing the car before George Barris completed it, and when they viewed the car it hadn't been glossed, only primed. 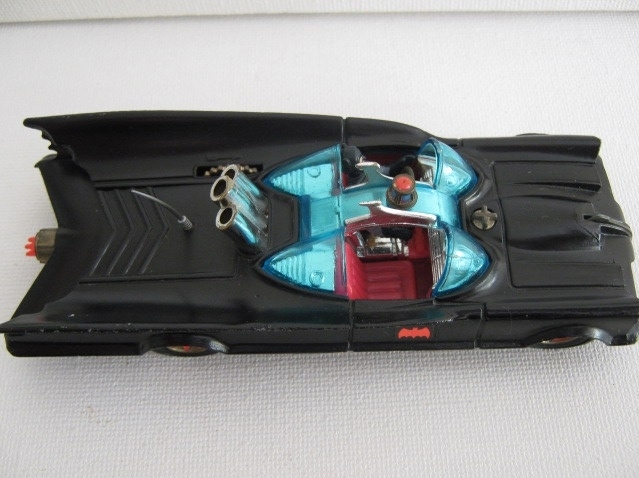 Corgi ran without the red stripes because it would have to be done by hand, and too many mistakes could have occurred, like paint runs, and then they'd have to re-paint them. Plus, since it was a factory, too much time would have been consumed doing this, and made the car a lot harder to purchase, as this would have pushed the numbers available in shops considerably down. It would also have made the car a lot more expensive. They ran with orange seats because the car in all black would have looked too dull, and since they weren't going to do the seats black, they didn’t bother with the red pinstripe on the seats either. 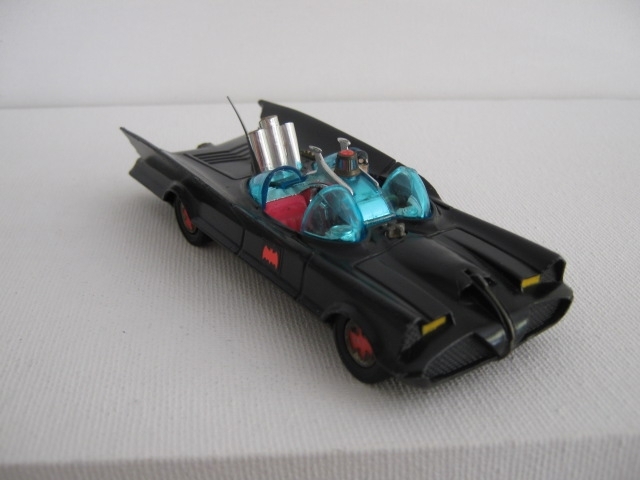 The blade at the front was Corgi’s idea, simply because they couldn't do the battering ram which was on the car in the series. 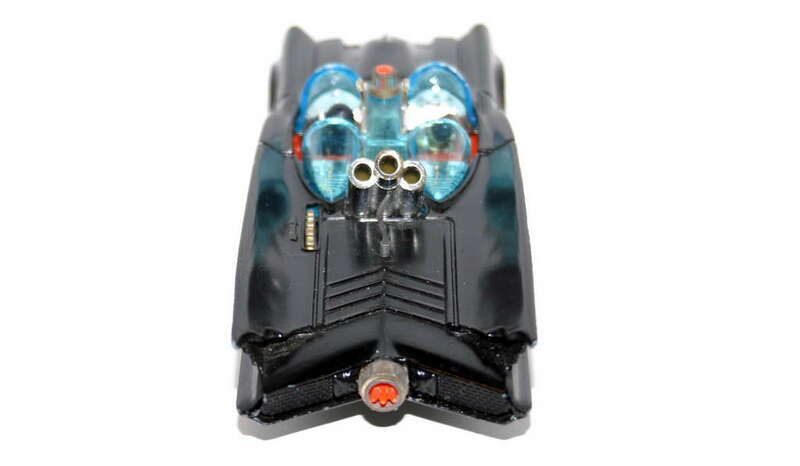 That came from underneath, so what Corgi did was use the scanner that popped up on the tv series as a button for the blade instead, which came out of the bodywork. 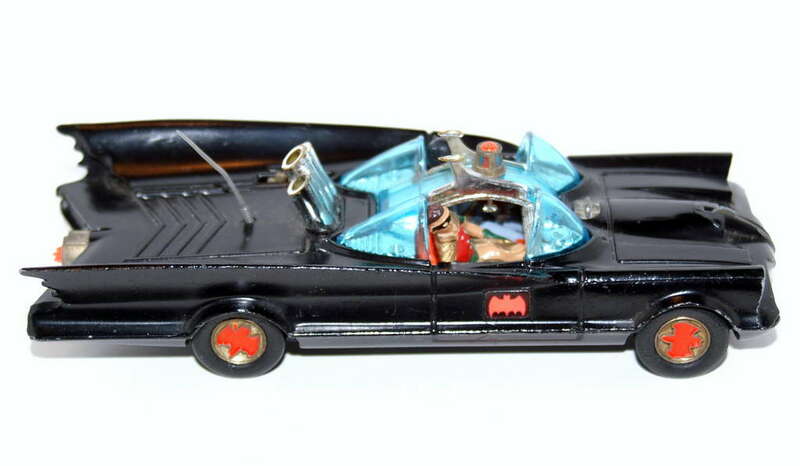 Batmobile in capital letters on the bottom of the car. What else is not commonly known is about the first version, the matt black. 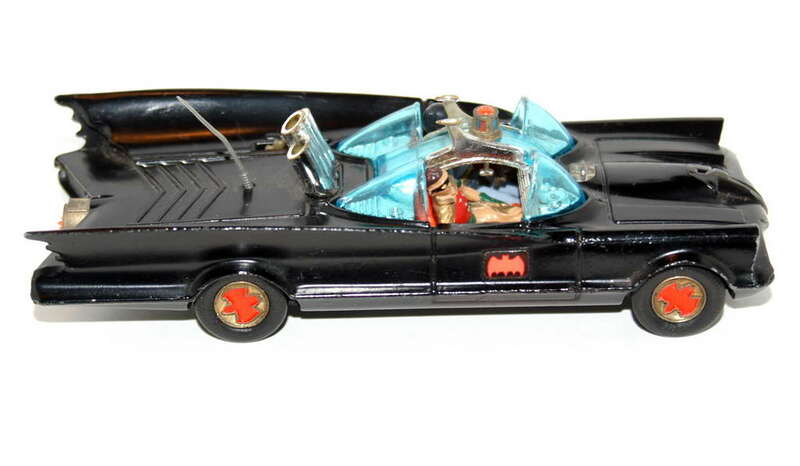 This was available in 1966 for 2 months only, and contained a very rare Robin figure. 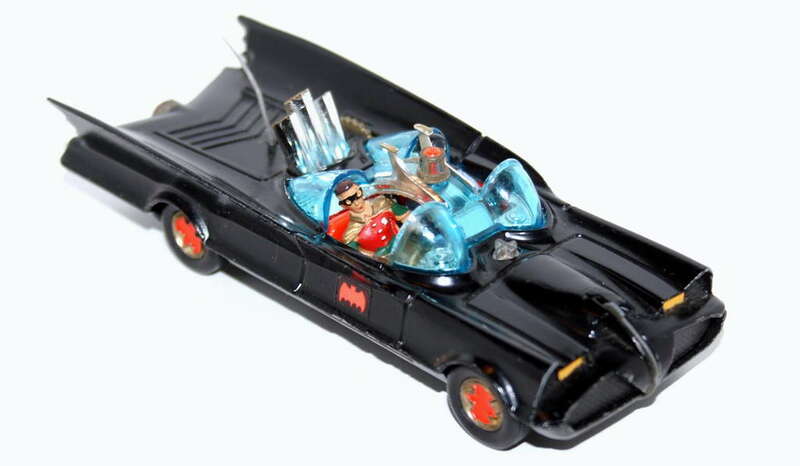 The Robin figure was a lot bigger than in later versions, and was very hard to fit in the car (unlike later versions, when you just tipped the car upside down and he fell out!!). 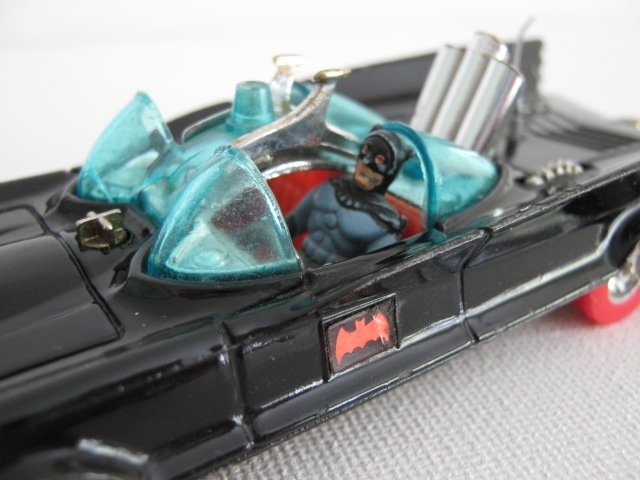 He was like this in the matt black ONLY, when the gloss version came out 2 months later, the Robin figure was slightly (but not very noticeably) smaller, whereas in the matt black he was impossible to get in or out of the car without cracking the glass. His head was above and rammed against the glass and very hard to get in the car!!! In later versions, he got a lot smaller!!! 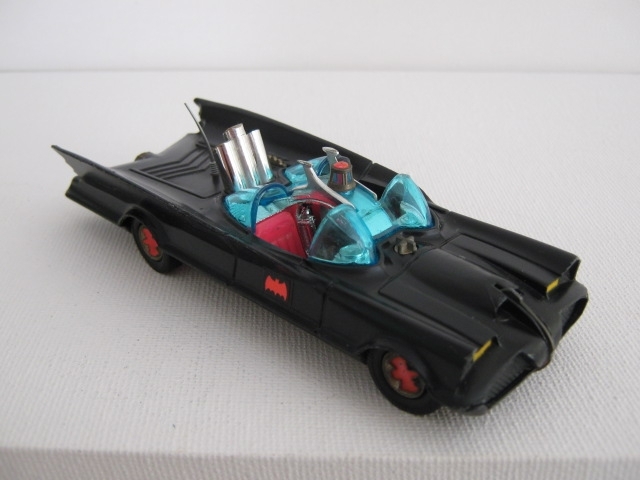 The last Robin figure made was made of pink plastic, and found in the last version of the Batmobile, the wide whizzwheels version. 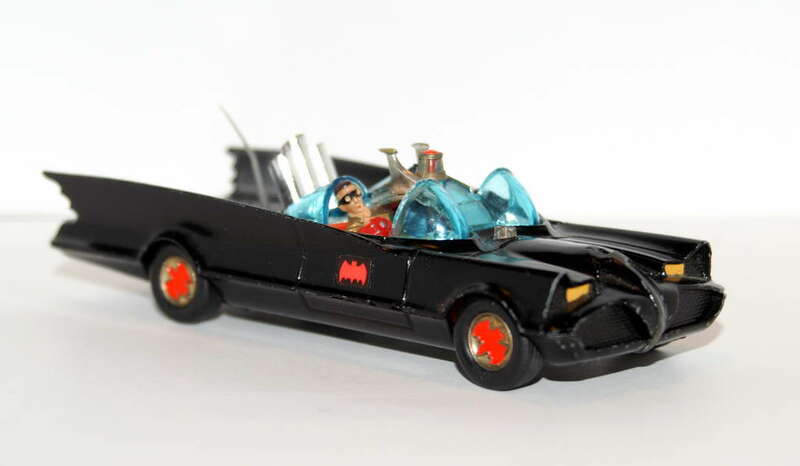 When the wide wheeled was put into its last box, the yellow black and red with detachable header card Robin was no longer included in the car. 1966 fold-out display box. This is the box that most people seem to want. 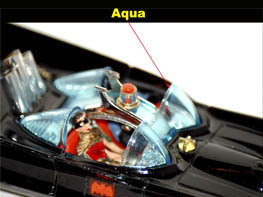 It has the nicest graphics on it and the inner fold-out forms a nice display for the car (which will leave your car vulnerable to collecting dust if it's not protected inside a larger display case). This box included a small envelope containing an instruction sheet (printed in light purple and black) which also had an application for the Corgi Model Club on the reverse side. 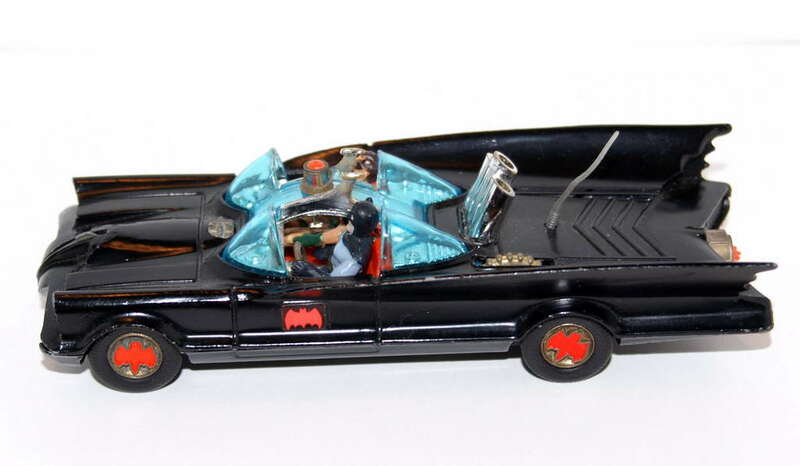 The envelope also contained a small leaflet which described features of the the Corgi Batmobile. 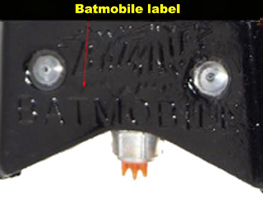 It also had an adhesive "Batman" sticker which Corgi referred to as an "owner's badge" (shown being worn on a lapel). 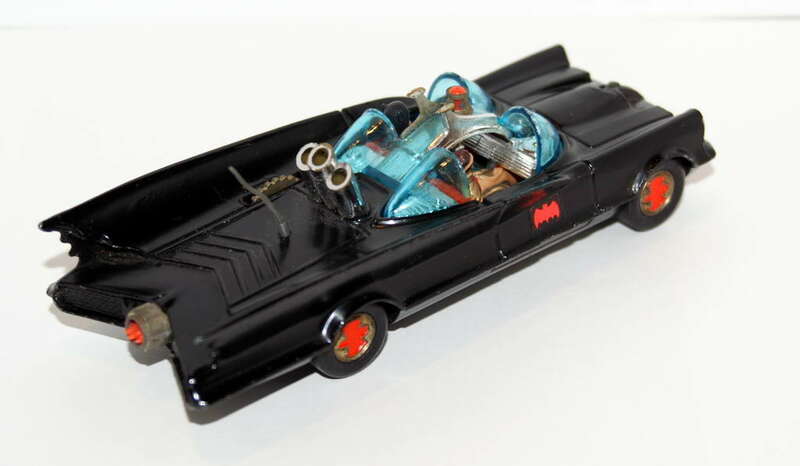 Finally, the envelope contained a sprue of 12 red missiles for the Batmobile to launch. Some people say that yellow missiles were also sold with this car originally. Purple seats to me are purple seats, not orange with a purple like effect. It's difficult really to class it as a different type of car. I don't know what causes this purple color... So Corgi must have made an error in the dye in this plastic too possibly (just like the glass). 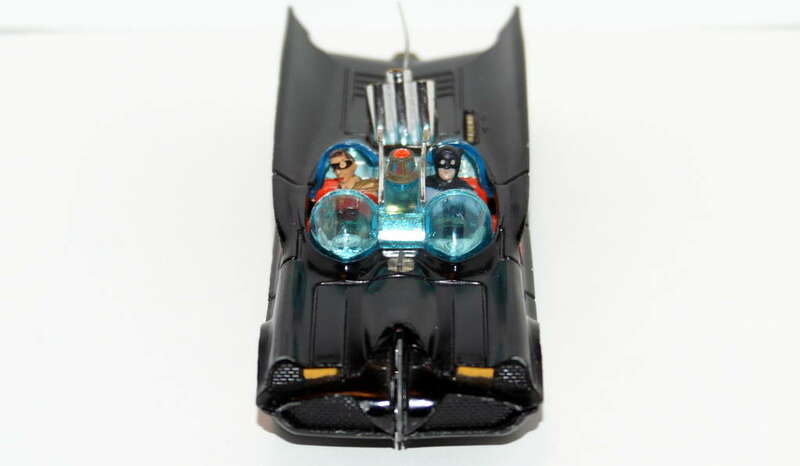 You can see the difference when its alongside another Batmobile. 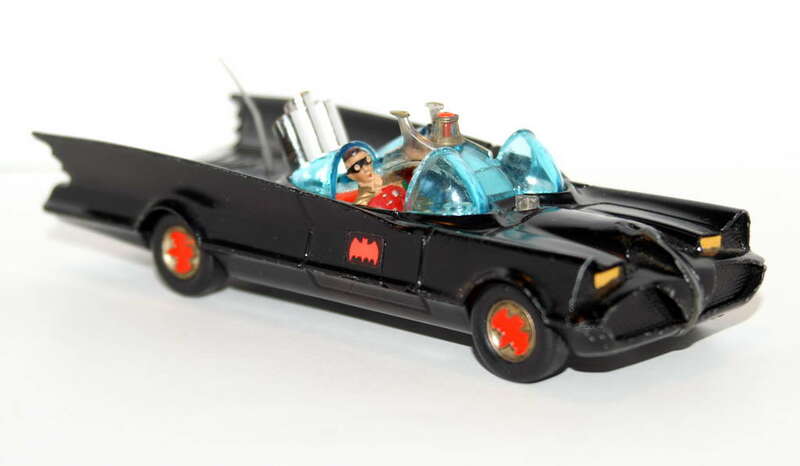 The Robin figure was a lot bigger than in later versions, and was very hard to fit in the car (unlike later versions, when you just tipped the car upside down and he fell out !! ).